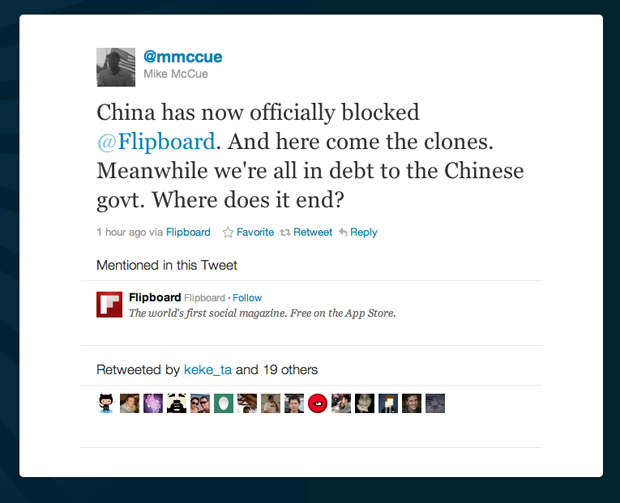 As of today certain aspects of the Flipboard experience have been blocked for Chinese users, at the very least access to Facebook and Twitter according to Flipboard CEO Mike McCue. While direct access to Facebook and Twitter is routinely blocked in China, the Flipboard app talked to its own US-based servers, which in turn talked to Twitter and Facebook so this block is particularly interesting. “Lots of folks in China had been using us happily until now,” McCue said, “Guess we had unwittingly poked a hole in their wall which has now been shut down… Presumably unless we block Facebook and Twitter ourselves in China.” The iPad app is still available in the Chinese app store. McCue tells me that it’s still unclear if you can access Google Reader, Instagram or Flickr from China and that we’ll know more in the morning about what exactly is going on. While McCue says that a small percentage of the app’s users are Chinese, Chinese clones like Tencent’s ICare, MagSina and the NetEase Reader are quite popular. Flipboard itself recently raised $50 million on a $200 million valuation.